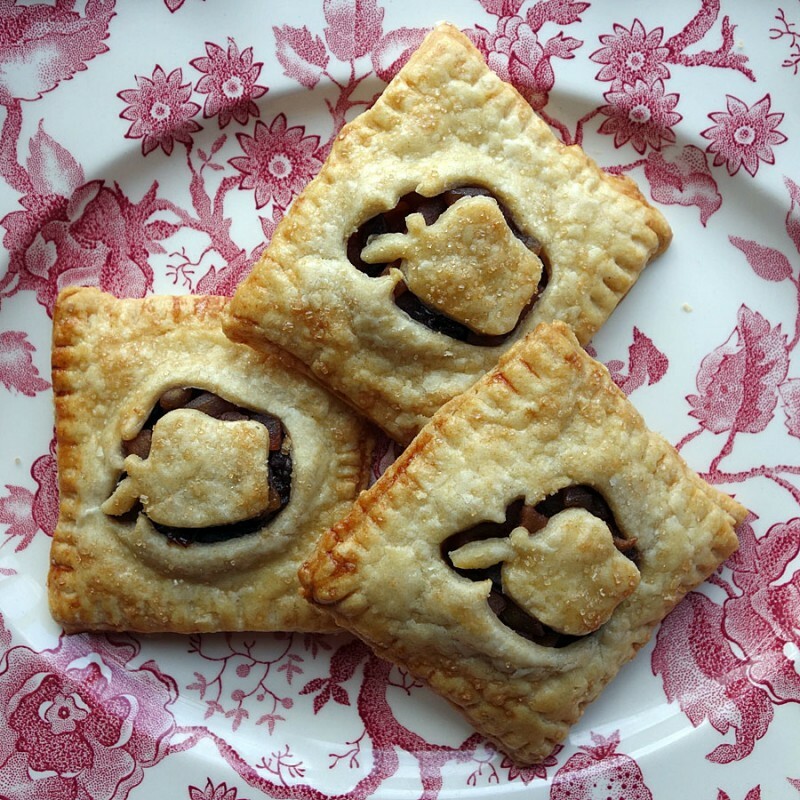 A recipe for cute little hand pies filled with apples, cherries and candied ginger. Macerate the apples by mixing them with the sugar, lemon juice and salt in a 1 quart saucepan and let them sit for 1/2 hour. The idea is to let the sugar and acid break down the apples so they get juicy. You use that liquid to cook the fruit so your filling is not runny. Have 1/4 cup of water on hand in case the apples don’t release enough juice. Add the cherries and ginger and cook the mixture over a low flame, stirring frequently until the apples are tender, the cherries and ginger are plumped and the excess moisture from the apples is mostly evaporated. Use a little water during the cooking process if the liquid evaporates before the apples are tender. The cooking time is 10-15 minutes. Cool the apples completely. Using one disc of pastry at a time (keep the remaining dough chilled), roll the pastry on a flour-dusted surface with a flour-dusted rolling pin in the shape of a rectangle approximately 10” by 20”. You can use scraps of the dough to fill holes and patch cracks in the pastry, but be careful to make sure the seams are well incorporated. Using a ruler and a knife, mark off and cut 18 - 3” by 3” squares. Place one tablespoon of the cold filling on the pastry square. If you want decorate the top square like the ones I made, use a small cookie cutter to cut out a desired shape out of the top square. Carefully remove the small shape and set it aside. Then, lay the cut pastry square over the filling and gently, but firmly, press the edges of the pastry together so the seam is sealed. Crimp the edges with a fork. Lay the cut-out shape over the space, which will now be slightly stretched out, so there will be a little gap around the cut-out shape. Alternatively, you can simply cut some air vents in the top pastry with a knife after you place it over the filling and seal the edges. Place hand pies on a sheet pan with 1” between each one. In a small bowl, make an egg wash by beating an egg with one tablespoon of water. Lightly brush the pastry with egg wash, especially at the edges. Sprinkle the top lightly with sugar. Chill the hand pies in the refrigerator while making the second half of the pastry into hand pies. When you are ready to bake them, preheat oven to 400 °. Bake for 15 - 20 minutes until golden. You can easily halve this recipe if you only have enough pastry for one pie.